DIE Veneris, 16 die Novembris. 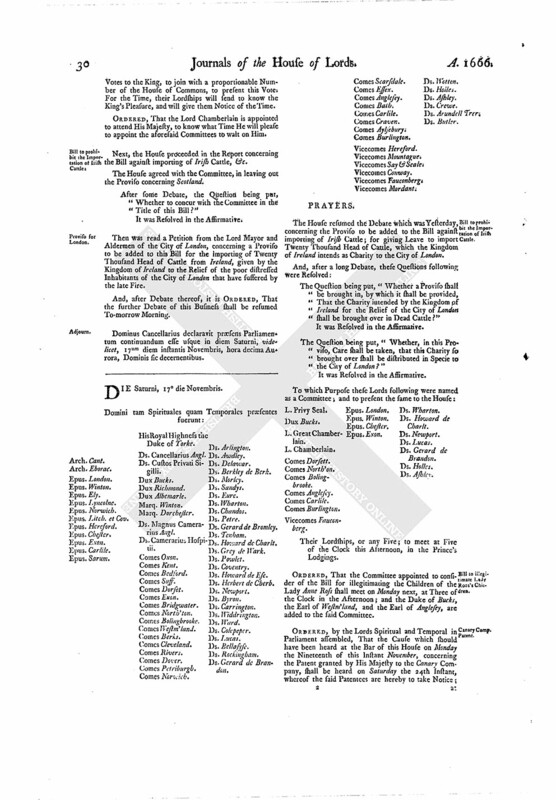 Report concerning Committees of both Houses examining Public Accompts. Message from H. C. to return Thanks to the King, for His Proclamation against Priests, Papists, &c.
The Lord Great Chamberlain of England reported from the Committee of Privileges, "That the Lords Committees have considered of their Lordships Order, referring to the Message of the House of Commons, wherein their Lordships are desired to name a Committee of this House to join with a Committee of their House, to examine Officers Accompts upon Oath; and have found many Precedents of Committees of Lords and Commons, but do conceive that all those Precedents are only of such Committees as are usually called Conferences, unless it be only Two, (videlicet,) one in 1640, and another in this present Parliament, 1661; which Two last Precedents are in Readiness, if the House shall please to have them read." ORDERED, That this House will take this Report into Consideration on Wednesday Morning next. To desire their Lordships Concurrence in a Vote, That the humble and hearty Thanks of this House be returned to His Majesty, for issuing out His Proclamation, and for other Orders and Directions given by His Majesty, in Pursuance of the Votes of both Houses presented to Him for the Prevention of the Insolency of Papists." ORDERED, That this House concurs with the House of Commons in this Vote; and, to that Purpose, appoints the same Committee of Twelve Lords that presented the former Votes to His Majesty, to be the Committee for this Business. That this House concurs with the House of Commons in this Vote; and their Lordships have appointed the same Committee of Twelve Lords as presented the former Votes to the King, to join with a proportionable Number of the House of Commons, to present this Vote. For the Time, their Lordships will send to know the King's Pleasure, and will give them Notice of the Time. ORDERED, That the Lord Chamberlain is appointed to attend His Majesty, to know what Time He will please to appoint the aforesaid Committees to wait on Him. Next, the House proceeded in the Report concerning the Bill against importing of Irish Cattle, &c.
The House agreed with the Committee, in leaving out the Proviso concerning Scotland. After some Debate, the Question being put, "Whether to concur with the Committee in the Title of this Bill?" 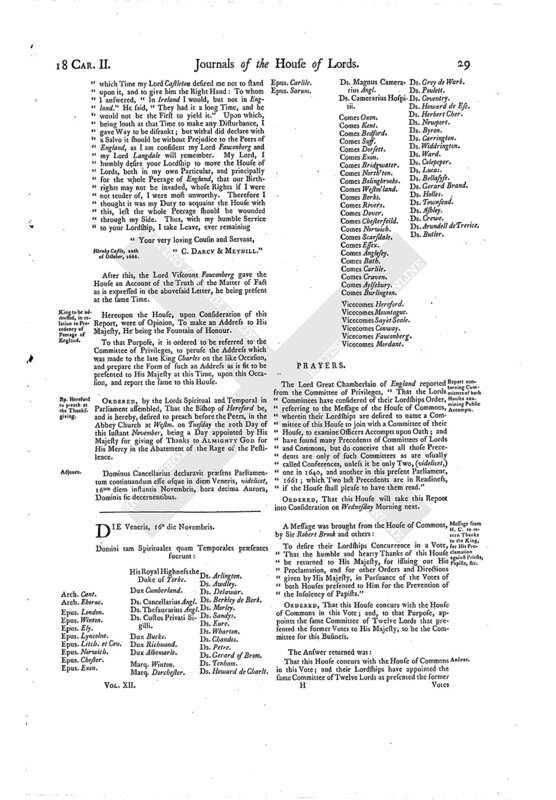 Then was read a Petition from the Lord Mayor and Aldermen of the City of London, concerning a Proviso to be added to this Bill for the importing of Twenty Thousand Head of Cattle from Ireland, given by the Kingdom of Ireland to the Relief of the poor distressed Inhabitants of the City of London that have suffered by the late Fire. And, after Debate thereof, it is ORDERED, That the further Debate of this Business shall be resumed To-morrow Morning. Dominus Cancellarius declaravit præsens Parliamentum continuandum esse usque in diem Saturni, videlicet, 17um diem instantis Novembris, hora decima Aurora, Dominis sic decernentibus.